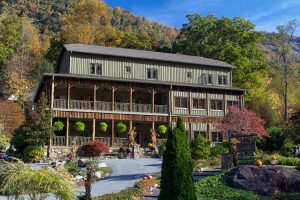 The Esmeralda Inn is a beautiful 14 room Chimney Rock Bed and Breakfast Inn that first opened in 1891 with all the charm and personality of the surrounding Hickory Nut Gorge. In addition to our many rooms, The Inn also makes available a large leisure area where guests can relax and enjoy multiple seating areas, quiet reading space, television and game room featuring billiard table, foosball, air hockey and board games. Spa & Jacuzzi – We want our guests to relax. The Jacuzzi and Spa, as well as the Patio, has more than 1800 square feet of stone patio as well as a free formed 15-person, in ground Jacuzzi tub that is designed for relaxation. Cabins – We also offer 3 private Chimney Rock cabin rentals for those looking for a more rustic getaway. All are located only a short distance from The Inn ranging from one to three bedrooms. Two of the cabins are located along the river, while the other one is just steps from The Inn. All of our Chimney Rock cabin rentals come equipped with full kitchens or kitchenettes, cozy electric fireplaces, and beautiful views from every vantage point. Restaurant – The Esmeralda Restaurant is the perfect place to dine during your stay with us at The Inn. Our menus reflect our exceptional attention to detail through carefully crafted dishes and combinations. When creating our dishes we prefer to use local vegetables and meats whenever possible, and the freshest seafood available. This is the perfect spot, whether you are planning on dinner for two or a group of up to sixty-two. Events – The Esmeralda offers a truly serene location for Chimney Rock & Lake Lure wedding receptions and rehearsal dinners. We have also been hosting Executive Level Corporate Retreats for years. Since we’re just a short distance from Asheville, Charlotte and Greenville, we have the perfect business meeting solution.